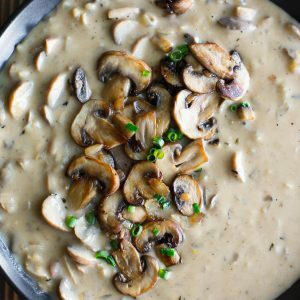 Let's cozy up with a bowl of this Creamy Mushroom Soup! This velvety vegetarian recipe is loaded with mushrooms and full of flavor! If using whole mushrooms, slice each into 3-4 slices (or simply snag pre-sliced as a time-saver). Dice onion and mince garlic. Heat a large pot or dutch oven over medium-high heat and melt your butter. Add onion and sauté for 2 minutes to soften, then add garlic, mushrooms, thyme, and allspice. Mix well and cook for approx. 5 minutes. Deglaze the browned bits from the pan with dry sherry cooking wine and stir. If you'd like to use a few spoonfuls of mushrooms as a tasty (but totally optional) garnish, use a slotted spoon to remove some of the veggies and set aside. I like to sauté these a little extra just before topping the soup. Stir in flour and allow to cook for 2-3 minutes. Next add vegetable broth, stir, and bring to a boil. Once boiling, reduce heat to a low simmer. Allow to simmer 8-12 minutes, stirring occasionally, or until veggies have reached your ideal tenderness (I love my mushrooms a bit al dente). Remove from heat and stir in half and half or heavy cream. Give it a taste, then season with soy sauce (love the flavor it adds), salt, and black pepper to taste. Since saltiness will vary based on broth used, simply taste and adjust to your liking. Garnish as desired and dive in! We love this soup served with a hot panini or hot and buttery garlic bread for dunking. Recipe yields 2 large bowls or 4 cup-sized servings. Enjoy!